We’re eager to share with you the results of the final quarter of Apple’s fiscal 2013. We had a strong finish to an amazing year and Peter will provide details about the September quarter shortly. But first I’m happy to tell you that Apple’s business is stronger than ever. We’re in a unique position of having world class hardware, software, and service skills under one roof, which enables us to provide an unparalleled user experience to hundreds of millions of customers. And working with our vibrant developer community, we’ve built a large and thriving ecosystem. We’re winning with our products in all the ways that are most important to us, in customer satisfaction, in product usage, and in customer loyalty. Our relentless focus in providing innovation that enhances our customers’ lives is evident in the extraordinary list of products that we’ve launched in just the last couple months. From the colorful iPhone 5C and forward-thinking iPhone 5S, to the powerful new iMac, MacBook Pro, and Mac Pro, to the stunning iPad mini with Retina display and the dramatically thinner, lighter, and more powerful iPad Air. Thanks to a deep collaboration between our design and engineering teams, we also launched iOS 7, with a stunning new redesign, powerful new features, and a great new service called iTunes Radio. We introduced OS X Mavericks, bringing new core technologies for breakthrough power-efficiency and performance to our Macs, and we introduced next-generation iLife and iWork apps for iOS and OS X, and we’re making all of this incredible software free, because we want our customers to have access to the greatest new features. All of these are products that only Apple could have delivered. And most companies would be proud to just have one of them. 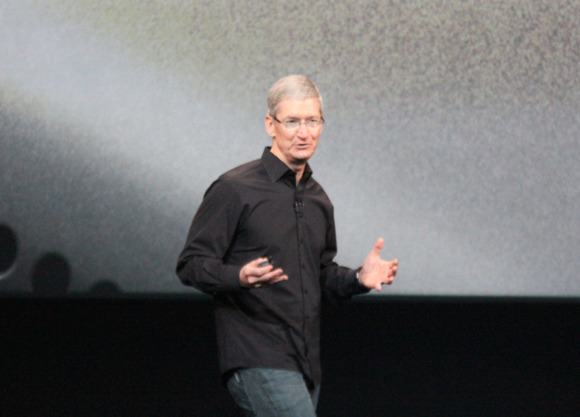 Looking back, we’re very pleased with Apple’s many accomplishments during fiscal 2013. Our customers had an incredible response to our product lineup, buying 150 million iPhones, 71 million iPads, and 16 million Macs across the fiscal year. We expanded the breadth and depth of our ecosystem, and we generated over 16 billion dollars in revenue in iTunes, software, and services. We also welcomed almost 400 million visitors to our retail stores, and opened or remodeled 49 new stores. And for the second year in a row, we produced over 50 million dollars in revenue per store. We generated record total company revenue of 171 billion dollars, earnings of 37 billion, and operating cash flow of 54 billion. We paid over 8 billion in capital expenditures to bolster our supply chain, expand our infrastructure, and increase our retail footprint. We also completed 15 strategic acquisitions—that’s an average of one acquisition every three to four weeks. We more than doubled the size of our capital-return program to 100 billion dollars, including the largest share-repurchase authorization in history, and we’ve become one of the largest dividend payers in the world. In fact, we’ve returned over 36 billion dollars to shareholders through dividends and share repurchases in the last five quarters alone. We remain firmly committed to our objective of delivering attractive returns to shareholders through both our business performance and a return of capital. We review our capital program regularly, and our board is engaged in a discussion of capital allocation on an ongoing basis. We have solicited feedback on our capital return program from shareholders in the past, we’ve greatly appreciated their suggestions, and we will actively seek their input again this year. As we have in the past, the board and management team will consider a wide range of issues and be thoughtful and deliberate and we will announce any changes to our current program in the first part of the new calendar year. We’re off to a great start in fiscal year ’14. We continue to be very confident in Apple’s future, and we see significant opportunities ahead of us in both current product categories and new ones. We’re participating in large and growing markets. Today smartphone penetration in the global handset market is only a little over 50 percent. The smartphone category is expected to grow significantly in the next few years, from about one billion units this year to over 1.7 billion in 2017. And the tablet market is growing at an even faster rate, from about 225 million units this year, to over 400 million in 2017. We’re continuing to invest in R&D and distribution, we’re expanding our geographic coverage, and we are building upon a phenomenal (but still very young) retail store presence. We’re also proud to be a force for good in the world beyond our products. Whether it’s improving working conditions or the environment, standing up for human rights, helping eliminate AIDS, or reinventing education, Apple is making substantial contributions to society. I’d like to thank all of our customers and our long-term shareholders for their loyalty, and I’d also like to thank Apple’s many talented employees who have worked tirelessly to bring us this far, and who are passionately focused on making great products that enrich people’s lives. Everything that you mention is the front end of a long roadmap. We have the first 64-bit smartphone, as you mentioned, and this is our first use of the fingerprint sensors. And if you’ve used it so far, you know that it’s pretty profound to both use it from a security point of view and to use it also to purchase apps and music and movies, et cetera. And so both of these, I think, the most important person here is what our customers think. These new innovations on the 5S and the 5C combined led us to have our best iPhone launch ever, selling about 9 million units through the weekend. So, we’re off to a great start. If you look at what we’ve done with our iPhone line. We’re selling the iPhone 4S as our entry offer, we’re selling the iPhone 5C as sort of our mid-tier offer, and then of course, the iPhone 5S. And our goal is to overall have growth for total iPhone, but also within that, we want to have each of those categories grow as compared to what we were doing previously. And so if you look at the total offers that we’re making in the low-end space and mid-tier and high-end, the sum of all the price points we offer there, we’d like to grow in each one of those. And we’re really pleased that we did that. So that’s how we measure, partly measure, success. Of course the most important thing for us is to make a great product. But we do need growth, and we’re happy that we’ve seen that. I realize that some people were reading rumors that our entry-level iPhone was the 5C, but that was never our intent. Entry level phone was iPhone 4S. As you know from comments that I’ve made previously, we were selling the iPhone 4 in very good volumes. And as we begin to experiment in different regions at somewhat lower price points, we saw a fair amount of price elasticity. And so we’re hoping and thinking that will continue with the 4S. All things being equal, what we would normally see on our products is that you have a large number of people who are early adopter related, that come into the market right after we announce and buy our very best product. And so other things being equal, that’s what we expect to see. I didn’t say in April that you would see them in this year and the first half of next year. So just to be clear on that. But what I have said is that you would see some exciting new products from us in the fall of this year and across 2014. And I obviously stand by that, and you’ve seen a lot of things over the last couple of months. In terms of new product categories, specifically, if you look at the skills that Apple has from hardware, software, and services, and an incredible app ecosystem, these set of things is very, very unique, I think no one has a set of skills like this, and we obviously believe that we can use our skills in building other great products that are in categories that represent areas where we do not participate today. So we’re pretty confident about that. The $400 number [approximate price for an iPhone 4 in China], just to clarify, is [the analyst’s] number, not mine. What we did with our lineup this time is that the 4S is replacing the 4. And so if you look at the U.S. as an example, the 4S is now free, the 4 previously was free. When you translate that out of the U.S., depends on the market as to what specifically has happened. As you know, currency changes and the strength of the dollar doesn’t play in our favor in some geos from that perspective. But generally, we see the 4S as our entry iPhone offer that gives someone the ability to access the entire ecosystem with a fantastic product. And we clearly understand that there is elasticity in the market, and we’ll move accordingly. We had a pretty good quarter in China. We obviously want to do better, but if you look at the quarter we did grow by 6 [percent]. Underneath that, iPhone units were at 25 percent year-over-year despite significant constraints on iPhone 5S that affected the whole company. However, we were able to launch in our first round in China, and that was a big change, and the result of close work and a relationship with the carriers in China and the government. And so we feel really good about that; we were able to do that on the iPad as well, as we announced last week. For the full year, the greater China region generated over 27 billion dollars in the sales force. And up 14 percent year over year. And so, we have a reasonable-sized business there. In the year-ago quarter, iPad launched. It launched late in China, and so that pressured the 6 percent down some; otherwise, it would have been, I think, even a stronger quarter given the strength of iPhone. And so we are continuing to invest in stores: We opened one additional store in greater China in the last few weeks; we’re investing in indirect distribution; our point-of-sales are up by about 50 percent year-over-year on the iPhone; and we’re continuing to go out to more cities. Initially, we were very focused on just the large cities, and so we’re working on both coverage, on launching earlier and execution, and continuing to build out our retail practice there. We continue to view the tablet market as huge. We see it as a large opportunity for us. We are not solely focused on unit share, as I’ve said many times; we’re focused on usage and customer sat, loyalty, and other things that are very important to us. We do believe that this has been—or that the announcement last week—was our largest iPad announcement ever, and we’re confident we’re going to grow year-over-year, and if you look back we had a very very strong quarter a year ago. We get off to a great start this weekend with iPad Air, and then later in the month we’ll begin shipping the new mini. We did feel that we wanted to reduce the price of the iPad mini, and so we did that and now are coming in at $299, which is an incredible value to get access to the whole of the ecosystem and so forth. And iPad Air is just an absolutely incredible product; the best iPad we’ve ever done. And so I think all of these are going—these products are going to do really well. I think it’s going to be an iPad Christmas. But we’ll see. We will report the numbers back to you in January how we did. But we’re pretty confident. Our primary reason for doing it was that we wanted it to become a part of what it meant to own a Mac, and what it meant to own an iOS device. We saw iWork had become the best-selling productivity app on a mobile device; we wanted all of our customers to have access to our very latest software, so they would have access to our best features; and so we decided to make the bold move of making it free. And y’know, I know some other folks charge $199 or so for each of these—actually, for the OS and the productivity apps—but we really wanted to make it a part of the experience. And so we’re making it free, and we’re going back all the way to Snow Leopard on the OS X side. And iWork is free for all new Macs, and so I think it’s a very strong offer. I think it’s just another reason that everyone should buy a Mac. And we think it’s a great decision to do so, but most importantly, we think it’s great for our customers. We had our best education quarter ever. We went over a billion dollars in revenues for the first time ever. We were up strongly, year-over-year—up 8 percent; iPad was up 22 percent year over year; and the Mac was up 8 percent, and as you know the PC market was down 10 [percent] in the aggregate and likely down even more in education. And so we feel like we’re doing great on both fronts, both in the iPad space, and in the Mac space for people wanting to buy a Mac. And we do see Chromebooks in some places, but the vast majority of people are buying PC/Mac or an iPad.